When I met my OH twelve years ago we each had a different favourite city in the world, which the other had not visited, so we made a promise to see each place together. In 2005 I went to Vancouver, his choice, and a very good one too, this is the story of my choice – Cape Town, South Africa. I lived in Cape Town between 1973 and 1984 and fell in love with this beautiful city. I was eager to return with my (new) husband to show him my favourite parts. It had been over eight years since my last visit to the Mother City and a lot longer since I had travelled along the Garden Route, so I was keen to explore old and new places and show him what I thought made this the best city in the world. On arrival at the politically neutral named Cape Town International airport we picked up the VW Polo hire car and drove to our first destination in Constantia. 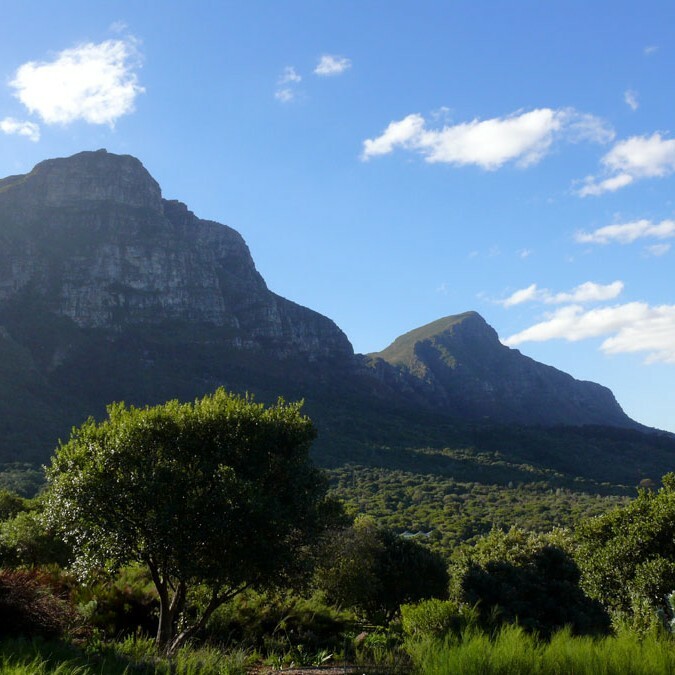 We were staying in a lovely, welcoming bed and breakfast close to the beautiful Kirstenbosch National Botanical Gardens. The only slightly off-putting aspect was the electric fencing surrounding the property and the guard at the entrance of the electronic gates. Oh, how things have changed, and not necessarily better for anyone. I was concerned that this might put my husband off. He already had some misgivings about visiting the country because of its notorious crime rate. Seeing the neighbourhood covered in ‘Armed Response’ signs wasn’t going to appease him. The weather on the other hand was perfect with azure blue skies, a soft, gentle breeze and it was pleasantly warm. 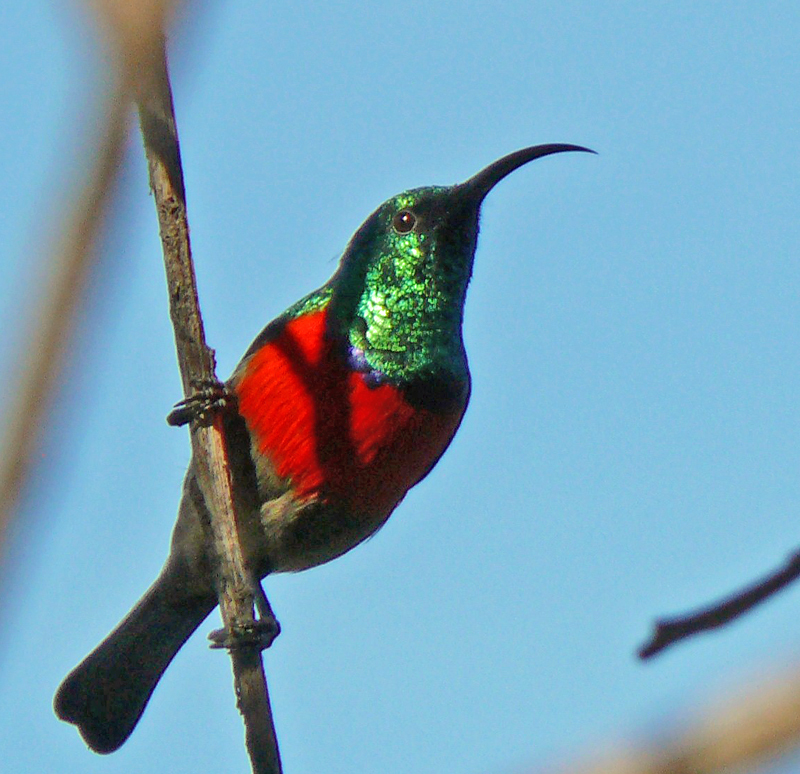 Having unpacked in our large bright bedroom, overlooking gardens to the front and rear, we strolled up to Kirstenbosch to stretch our legs after the long flight from London, via Windhoek and get some well-needed sunshine. This botanic garden is so tranquil and the backdrop of Table Mountain is so dramatic I could have stayed here for the entire trip photographing the many spectacular proteas and sunbirds. It became a regular evening walk during our stay. Later we drove over Constania Nek and down to Hout Bay and along the coast road to Llandudno hoping to see a decent sunset, but cloud on the horizon put paid to that idea. As we drove back to the B&B we called in for a meal of Kingklip, a firm white, buttery, local fish and chips at the Constantia Nek Hotel and Pub. A South Westerly brought in rain, wind and cloud overnight, but it brightened up over breakfast which was excellent – fresh fruit salad and yoghurt, cooked breakfast with choice of eggs, multi seeded bread and good coffee. 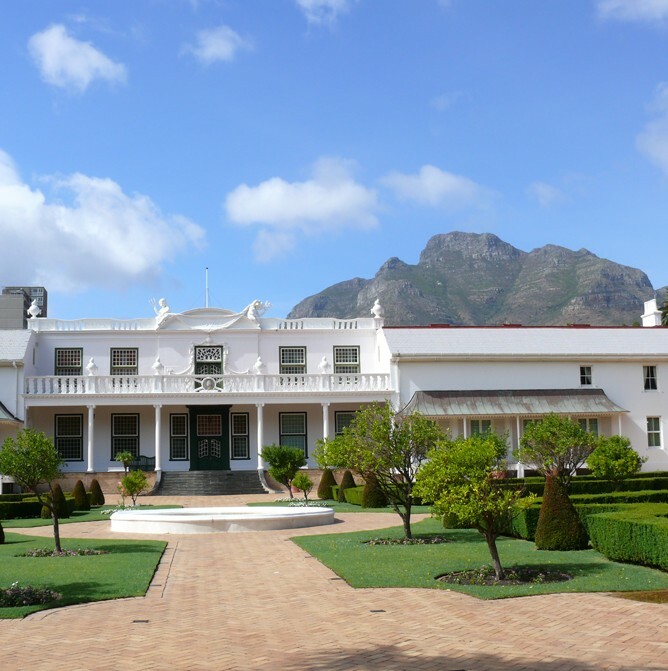 We drove into the city and parked in the eerily empty Grand Parade, where the Italianate City Hall is located, and made our way along Adderley Street for a wander through the Government Gardens or ‘Company’s Gardens‘ as it is also known. 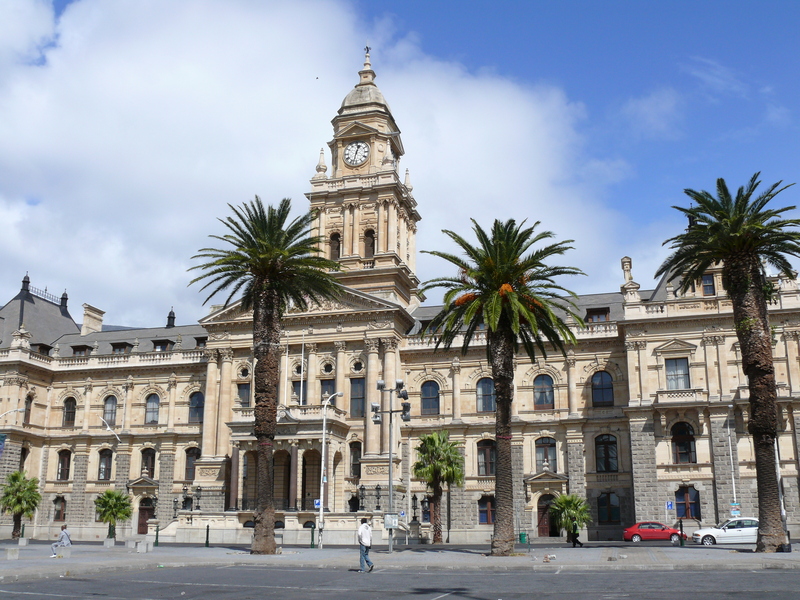 The pedestrianized tree-lined Government Avenue links the top-end of Adderley Street to Orange Street where you will find the famous Mount Nelson Hotel, “Cape Town’s famous pink hotel”, with her distinctive blush-tint and English High Teas. Tea at the ‘Nellie’ (as it is fondly referred to by locals) starts at 2.30 pm and runs until 5.30 pm. 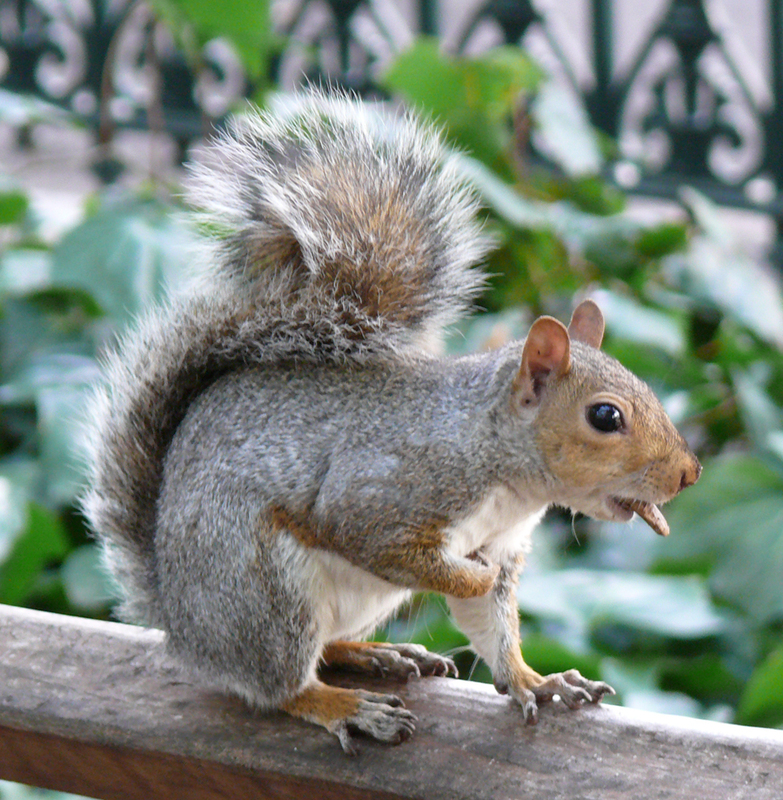 The grey squirrels which inhabit the trees lining Government Avenue are a delight. They were introduced by Cecil Rhodes in 1890. 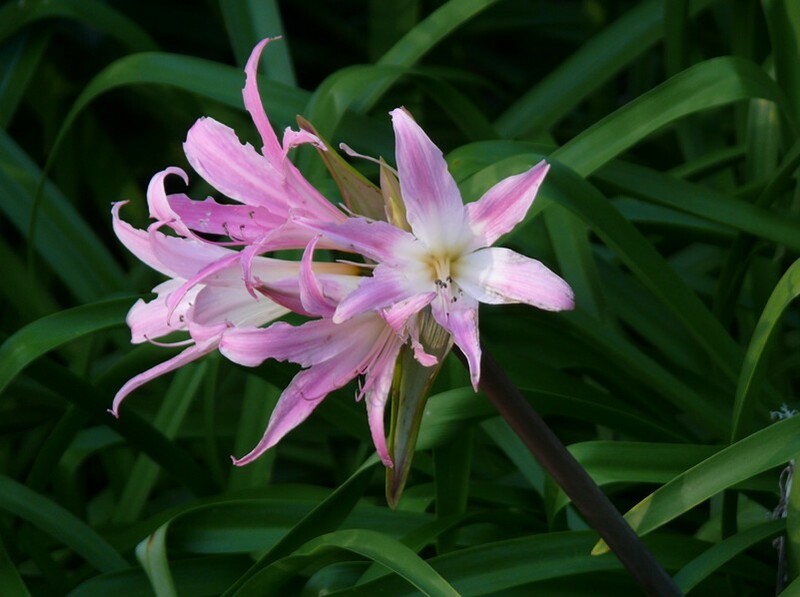 These are larger than their European counterparts and the Garden’s oak trees and plenty of water channels offer a perfect habitat. They are fairly habituated to humans and will eat out of your hand, you can find someone to sell you a packet of peanuts with which to feed them. However, the downside is that you may also see huge rats. It has its own rose garden, aviary and fish-pond. In fact they used to sell off some of the fish from here when they got too big or too many, though I don’t know if that practice still occurs. 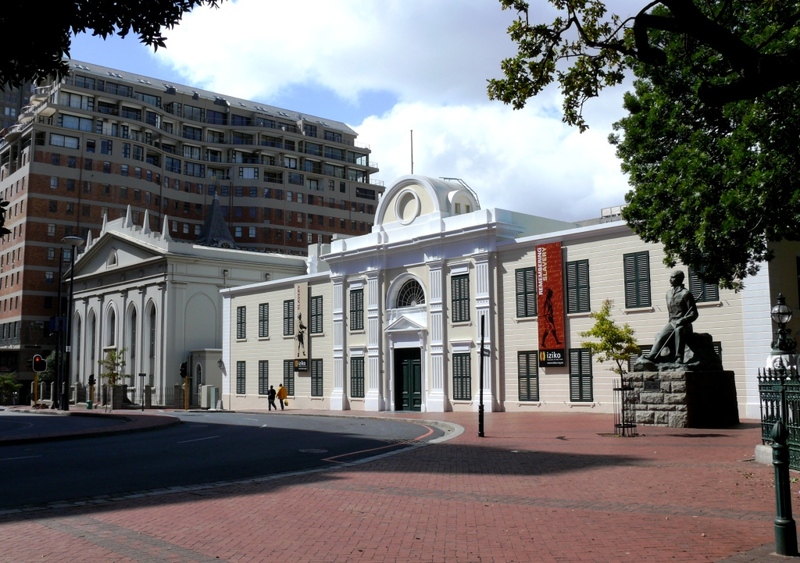 This area is known as ‘Museum Mile’ in that the vast majority of Cape Town’s museums are concentrated into the same small space around Government Avenue including the South African Museum and National Gallery. The Iziko Slave Lodge lies just outside the entrance on the corner of Adderley Street and Wale Street and is now a Cultural History Museum. Close by in Greenmarket Square you will find another museum in the Old Town House. 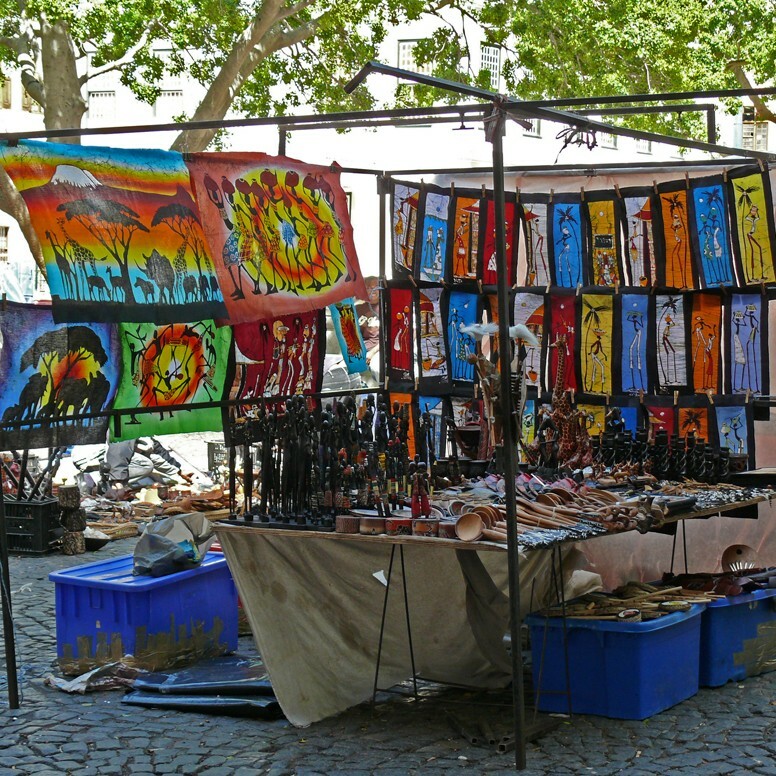 We strolled along to Greenmarket Square where a flea market is held, but found that rather disappointing as there were only a few African craft stalls present and all selling the same objects (wood or soapstone animals, wire and bead ornaments, masks etc.) which to be honest looked mass-produced. The city centre was a bit like a ghost town with hardly anyone about and it felt a little unnatural. My last visit to the city was in December 2000 and it had been much livelier with buskers and shoeshine ‘boys’ so I can only assume that Sunday is not the best day to venture into the centre. Leaving the centre we drove up Kloofnek Road to the cable car station only to find it closed due to high winds at the top of Table Mountain. Another fail. With the weather becoming increasingly blustery and chilly I needed to find somewhere to impress the OH. 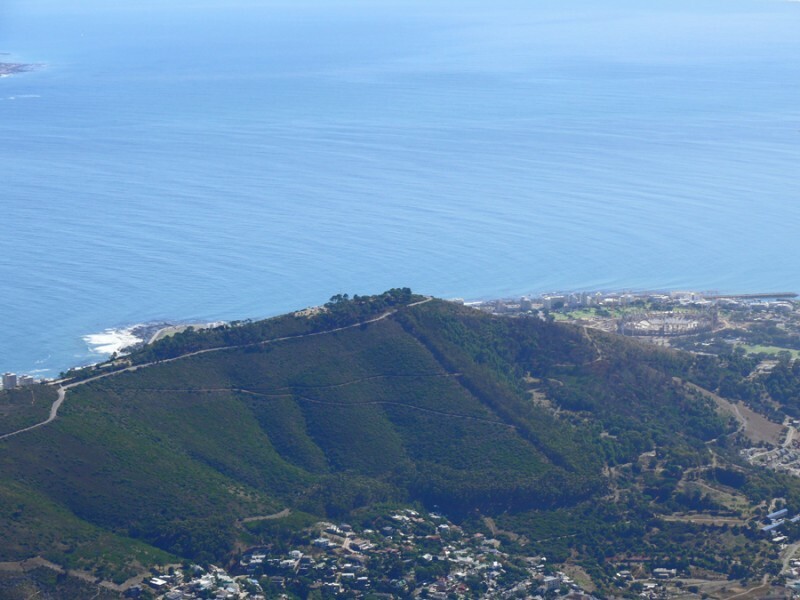 We retraced our route back to Kloofnek Road and then headed across and up Signal Hill, the lion’s rump, which connects Kloof Nek with Lion’s Head. From the top you have a spectacular viewpoint over Green Point (home to the 2010 World Cup Stadium), Sea Point, Robben Island and the north coast around Table Bay. This used to be open waste ground, but has been radically improved in recent years with tarmac surfaced, designated parking bays and public toilets. 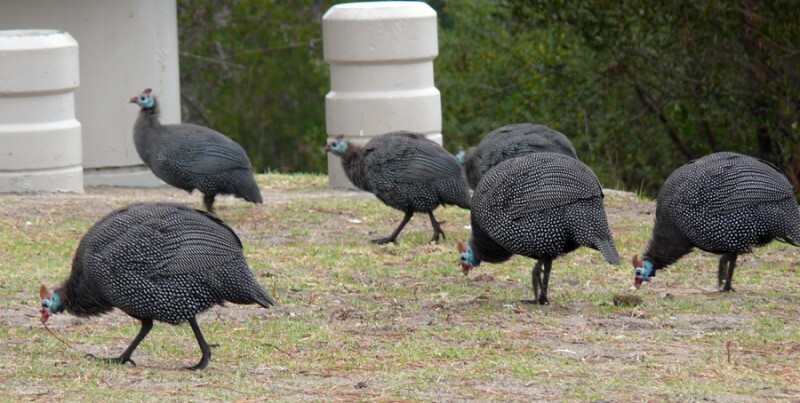 Wild helmeted guinea fowl ran around the car-park. The spectacular views over Cape Town were unchanged and apparently it is still the place for locals to go for sundowners. A heavy squall sent us running back to the warmth and shelter of the car and to consider where next to go. We decided on the Victoria and Alfred Waterfront and discovered that this is where Capetonians go on a Sunday. I love the hustle and bustle of the Waterfront, but as I am not a shopaholic, a short visit is all I need to drink in the atmosphere. 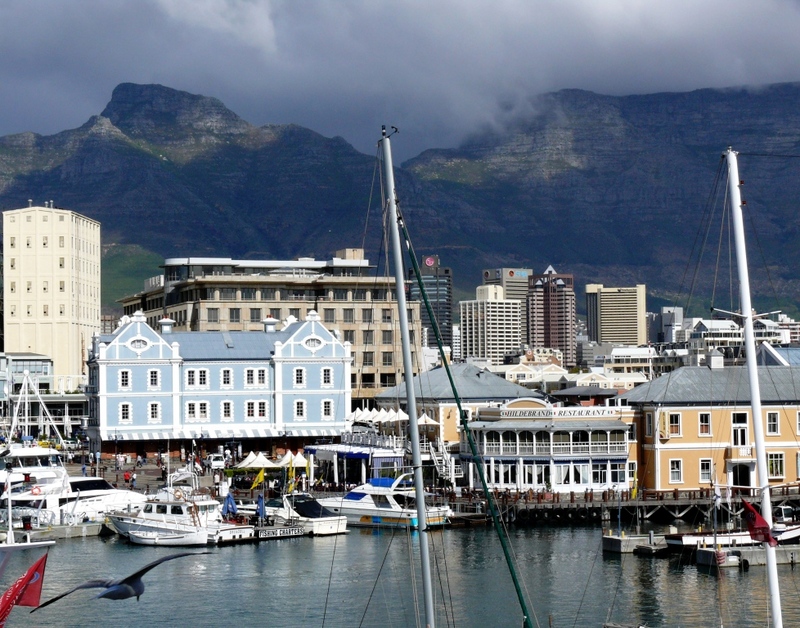 It is lively, busy and again has that lovely backdrop of Table Mountain and is the place where you can catch a ferry over to Robben Island. We stopped for a drink outside a little bar so we could people watch and then headed to the Two Oceans Aquarium, which I believe to be the best Aquarium in the world. 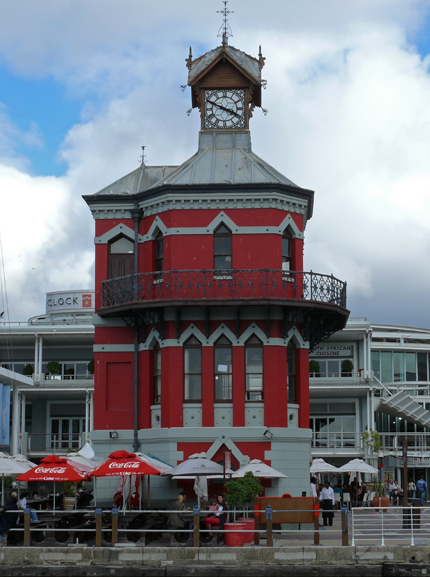 I recall the original Victoria and Alfred basins; it was from here that liners stopped en route from UK to Australia, and where once a little café served the best fish and chips in Cape Town, quite possibly the original Bertie’s Landing Restaurant near the Victorian Gothic-style Clock Tower. Cape Town is HIGH on my wish list. I can’t wait to see it in person one day. I hope you get there PS, it’s my favourite city in the world. Ah, the rusks! Ouma Buttermilk were my favourite! I think you can buy them from the South African shop in London – I’m sure my daughter has at some point (her partner is from SA) along with anchovy paste that you can’t buy here and I love! Ah, yes Pecks! I used to have it on toast for breakfast too – a weird thing to have for breakfast if you think about it. But so delicious! I must ask my daughter to get me some. Lovely post Jude! Hope you can come back here one day! I hope so too. I love Cape Town, though I have no family left in SA now and I do have family in Australia so that country has priority. Thank you for this wonderful tour! I hope one day I can see it in person. It is still my favourite part of the world, though the crime rate is off-putting. Such a shame. You got me straight off with Pinotage Jude, my favourite Red Wine. I have a bottle on the worktop ready to drink later tonight! Stunning photos, and great travelogue too. Makes me want to go there, so you can’t ask for more from an article. You have some really great pics, Jude. It’s ten years since I was there, and I doubt I’ll be back there before we leave in September. I’m holding thumbs for the General Elections on Wednesday, that the DA manage to retain their hold on the Western Cape. Thanks Sylvia. It’s a lot more than 10 years since I was in Durban! My eldest two lived there for a while in the late 1990s. Great trip around your favourite town and its outskirts, Jude. Thanks Jenny. There will be more on the trip over the next few weeks. Cape Town is a city which has always fascinated me for some reason but of course I’ve never been there. It’s great to read more about your life there and to have this tour through your eyes, very enjoyable. I love the look of the harbour especially. Never been but simply everyone I know who has been says it’s fantastic (and oh so cheap at the moment too). I don’t think it is as cheap now as it was a few years ago, but it is still very cheap compared to here. We stayed in lovely B&Bs for £80 a night and food and drink is very good! One nice thing about CT is that you can fly overnight and you don’t have any jet-lag! my friend, Gracie went last November – loved it and as you say eating out was at give away prices cf here or the States or NZ and soooo cheaper than Australia! And they drive on the left! There’s certainly lots to admire, Jude. The flora and fauna and the views are spectacular. I don’t know the political setup too well but it always seemed to me that the Afrikaners had a very skewed outlook on life? How did you come to live there in the first place? I’m afraid when I first went there I was totally ignorant about the political set-up, but I fell in love with the country and that was that! I can imagine. I have a friend who had a similar love affair with Zimbabwe. Sadly she had to return to the UK when Mugabe raised his ugly head. Ah, Africa and its dictators. When will they ever learn.